500 Tasty Sandwich Recipes is one of a series of 1940s booklets offering hundreds of recipes for a particular item: salads, sandwiches, and dairy-based dishes have made it into my collection. While writing Recipes of the Damned entries I found hilarious possibilities: molded salads arranged to look like flowerpots, peanut-butter rarebit (yes, really), and perhaps best of all the “treasure sandwich chest,” which requires you to hollow out a loaf of bread and fill it with assembled sandwiches. With hundreds of recipes per booklet, I thought I’d never run out of possibilities. So you can imagine my surprise when I did a recipe count during the cataloging of my collection, and found that none of these books actually has as many recipes as advertised. Sandwiches? Only 351, and that’s counting every possible filling variation plus all the recipes for breads. Salads? A mere 447, well under the booklet’s promise of 500. Dairy recipes? Just 259, not the 300 promised by that title, though the closest to its promise of the three. Truth in advertising aside, I decided that sandwiches would be great for supper on a warm summer evening. 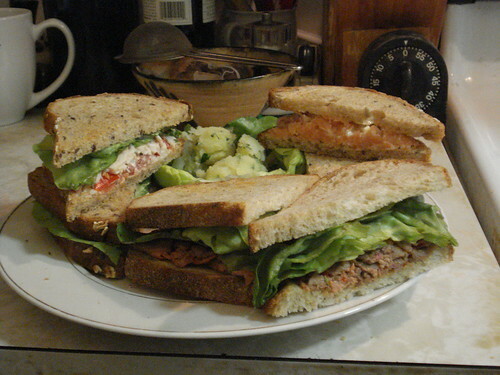 I thought that variety might be pleasing, and also that while I might well pick one dud I could surely not pick three, and so I settled on chicken and bacon salad, salmon and cucumber, and beef. 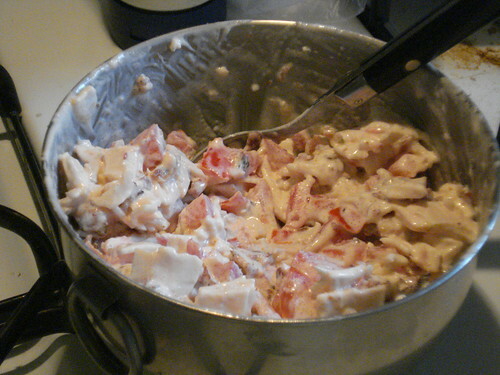 Preparation of the chicken and bacon salad is fairly simple: one cup of chopped cooked chicken, half a cup of diced bacon, half a cup of diced tomatoes and half a cup of mayonnaise. And if you think that sounds like a lot of mayonnaise, well, you’re right. I had determined to follow the instructions for all these untried recipes, but I had misgivings when I measured out the mayonnaise. I went ahead, and found myself with a rather creamy mixture. It tasted good, which I think is partly because the bacon and the tomatoes were very high quality, but if I were to make this again I would use a lot less mayonnaise. 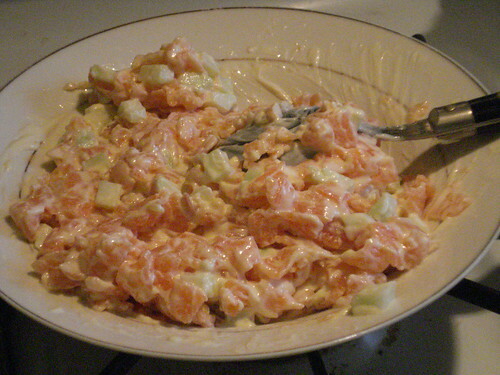 I mixed up the salmon and cucumber salad next, and was far more skeptical about the mayonnaise this time. Overdoing the mayo seems especially wrong when you’re dealing with salmon, whose flavor deserves to be accentuated, not smothered. 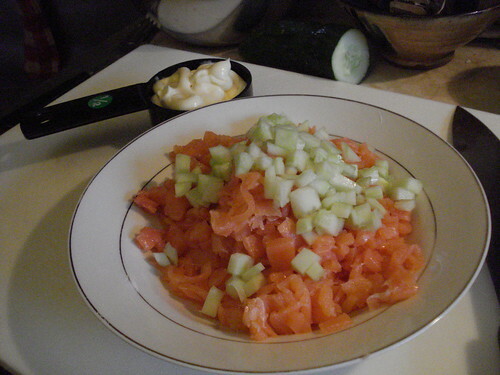 I mixed up cooked salmon and chopped cucumber and far less mayonnaise than recommended, for a still very spreadable, even mayonnaise-rich, filling. I can’t imagine how goopy it would have been with the full amount. Finally I turned to the beef filling, which was blissfully free of mayonnaise. Cold roast beef is combined with salt, chili sauce, Worcestershire sauce and melted butter. 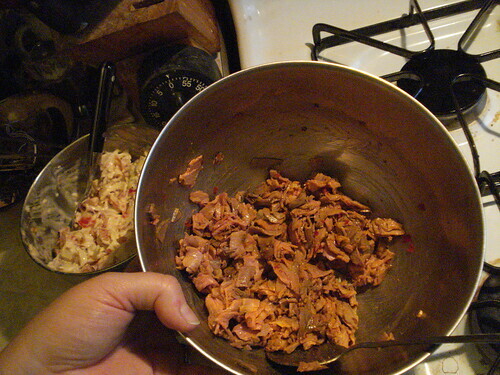 I am not sure what the author meant by “chili sauce” in 1949; I seriously doubt she meant the kind that you get at Asian markets, in the plastic bottle with the strutting rooster, glittering with pepper seeds, but that’s what I had on hand and that’s what I used, and it turned out to be really tasty. Peppy, zingy, but not so strong as to overpower the beef or Worcestershire sauce. 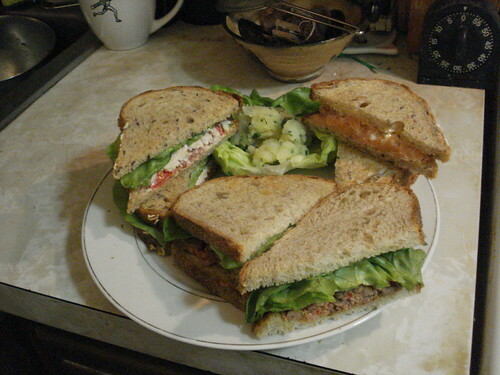 I spread the sandwich fillings on toast and added lettuce to the chicken and salmon, and served them up with potato salad. 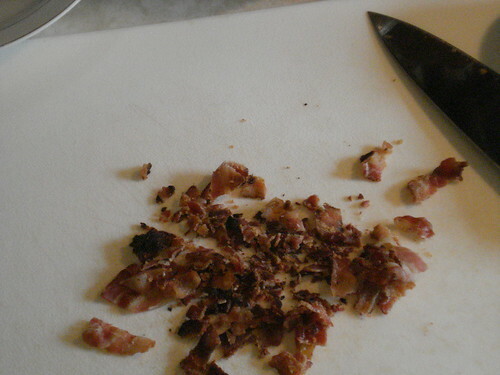 I did not go the extra step of cutting off the crusts; I may be nuts but even I have my limits. The sandwiches were all delicious, even with an excess of mayonnaise. Verdict: Success. I’d make them again, with adaptations, and they did make for a nice cool supper on a warm, humid night. And that brings us nearly to the end of July’s book list; only Jell-O remains. (Cue dramatic music.) More details on that tomorrow. The treasure sandwich chest seems like a great idea for catering or a party. As presented in the booklet it’s a bit fussy, but I don’t think it has to be.